Ken Clarke has long been my favourite Tory politician. His reputation strengthened in my eyes today by appearing to fall asleep during George Osborne’s Budget Speech. The Justice Secretary’s people deny this ‘slur’ but Labour leader Ed Miliband said he had – and more importantly bookies Ladbrokes paid out at 16-1 to the 50 or so punters, who forecast 70-year-old Clarke would nod off. Clarke’s public image – tubby, jolly, and a bit shambolic – makes a refreshing change from the cloned personality-challenged ‘suits’ that count for the new crop of Tory MPs. Clarke has found himself hero and villain by turns. His support for closer ties with Europe denied him appointment to the highest job in his party. While he was right to oppose the Iraq invasion, his enthusiasm for the UK’s membership of the euro has proven misplaced. He enjoyed a good period as Chancellor of the Exchequer, while the jury remains out about his current performance at the Justice ministry. I found myself seated once next to Clarke at a business lunch about 10 years ago. Labour was well into its first term and the MP was marooned on the backbenches. He was, it has to be said, deputy chairman of British American Tobacco at the time and therefore in league with the devil. Up close, however, Clarke was a hard man to dislike. He had an encyclopaedic knowledge of jazz. He shared a passion for the music with Alan Greenspan, the legendary chairman of the US Federal Reserve, who early in life played saxophone professionally. Clarke told amusing anecdotes of conversations about jazz with Greenspan when the two got together after formal International Monetary Fund sessions were over for the day. 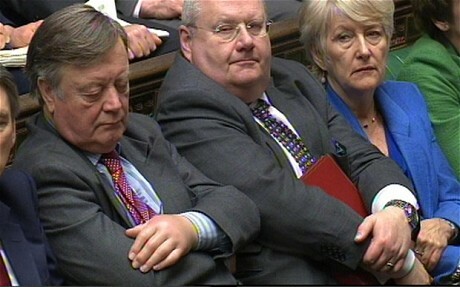 As for falling asleep during the Budget Speech, I have experienced the same fate as Clarke. Not, I hasten to add, when I was City Editor but certainly while a callow financial reporter. In those days the Chancellor stood up at 3.30pm - after a long lunch had been taken. Listening to the Chancellor drone on while seated in a stuffy office having consumed one pint too many, the eyelids would begin to droop. My secret was to drift off while keeping my eyes wide open, all the time scribbling in a notebook. Most of my notes proved to be indecipherable. Then as now the actual Speech wasn’t as important as its analysis – both the Treasury’s and the City’s. Refreshed from my snooze and deadlines approaching, I swung into action. We’d be back in the pub by 6.30pm, drink until closing time, and return to the office for the first editions of our rivals. Then – once at least – on to Ronnie Scott’s jazz club, which, more or less, brings me back to Ken Clarke. Re your final paragraph, GC, what about the geezer next to him, as portrayed in the photo you have included with your piece. Pickles is also not exactly a zoot suit.